Baby you're a firework! All about July 4th! With Independence Day right around the corner we thought that we would take the time to give tips on celebrating. However, we would be remiss if we didn't first take the time to honor those that so lovingly laid down there lives and sacrificed so much for our country. Hats off to you! We salute and honor you for protecting us with such courage and selflessness! Regarding all the fun and festivities we thought that we would give you a couple ideas and tips for this year's 4th of July! 1) Have crafts for kids! Why not have sidewalk chalk and paint along with your water slides or astro jump for the kids. Not only does the craft above incorporate fireworks but it will be a great pastime for the little ones. Another idea is to set up a relay or a game of true or false around the history of Independence Day. Instead of the typical Heinz bottle sitting around on the table or Masterpiece barbecue sauce near the grill opt for a display that is more pleasing to the eye. Trust me, a display like that above will keep your family looking forward to the next event for sure! 3) Build-Your-Own anything you can imagine! Instead of just getting your burger right off the grill, choose to create a build your own burger station. Or even have an ice cream buffet with lots of toppings. You could even have a hotdog and bratwurst station next to your sauce station with toppings such as onions, ketchups, and more. It's all up to you! Everyone loves a good sweet, treat! So don't forget the popsicles, rather they are homemade or store bought. 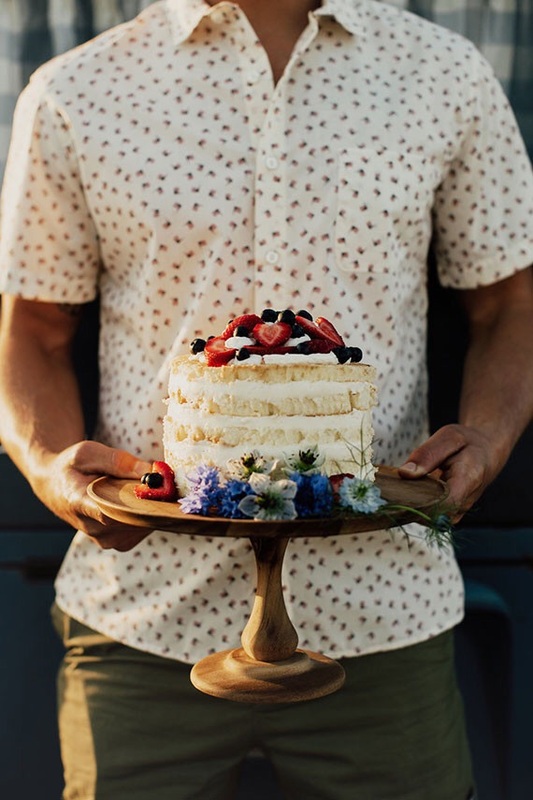 But, if you enjoy baking why not go for a naked cake like the one above, topped with patriotic colored berries or icing. The classic blueberry or cherry pie are other great alternatives as well! Really, the possibilities are endless! Lastly, do not forget about that ice, cold yet very tasty drinks this Independence Day. Good Housekeeping gives a great example of a drink that is sure to be a crowd pleaser - Berry Lemonade. As pictured above, pair the drink with holiday friendly glasses, it adds an even more festive feel! Now we turn to you! Do you have any tips or tricks that you implement into your yearly celebration? Comment below, we would love to hear them!